The Sailing Centre offers powerboating courses that are part of the RYA National Powerboat Training Scheme. We bring our flexible and hands-on approach to powerboating and can design a customised course for your specific needs. We can conduct the tuition on your own boat if required, offer pilotage suggestions and advice on local places to go with your boat. We cover the required syllabus for each of the RYA courses conducted, but we place a lot of emphasis and additional content on seamanship skills, practical tips and local knowledge to make your time boating on Scilly easier and more enjoyable. 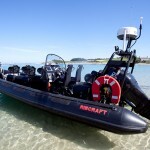 While the primary objective of the course is to get you to the required standard for certification and to make sure you are safe and confident, we make the most of the stunning natural beauty of Scilly and ensure you get to see plenty of the islands whilst on the powerboating course. We have a strict ratio of no more than 3 persons on each course so that you get maximum tuition. 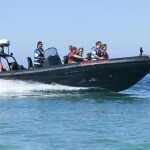 This course is a one-day introduction to basic boat handling techniques and is ideal for someone who has never driven a powerboat but has always wanted to have a go. On successful completion of this two-day course you will receive the RYA Powerboat Level Two certificate, which is now classed as the national certificate of competence. 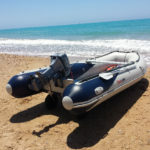 The objective of the course is to give you an introduction and good grounding in the basic knowledge and skills required to handle a powerboat safely and effectively. This is a two day course designed for those who are involved in watersports and might be asked to provide support or safety cover for their sailing club, school or other water based activities. Persons on this course must hold a level two certificate, be aged over 16 and reasonable boating experience on top of completion of the level two course.